We thank the Iranian Association for contributing to this project. The participants discovered a completely new aspect of the history of their country and were able to relate it to the context of living in the UK. You can read about their thoughts and feelings here. On Friday 6th October 2017, a group of 10 Iranian Association volunteers/members visited the Imperial War Museum. The tour was made possible by Mr Alan Wakefield and the ‘Away from the Western Front’ project. Mr Wakefield welcomed the group and provided an informative presentation about the British forces in Persia (i.e. Iran) during the First World War and talked about the photos taken by the British army officers in Persia. 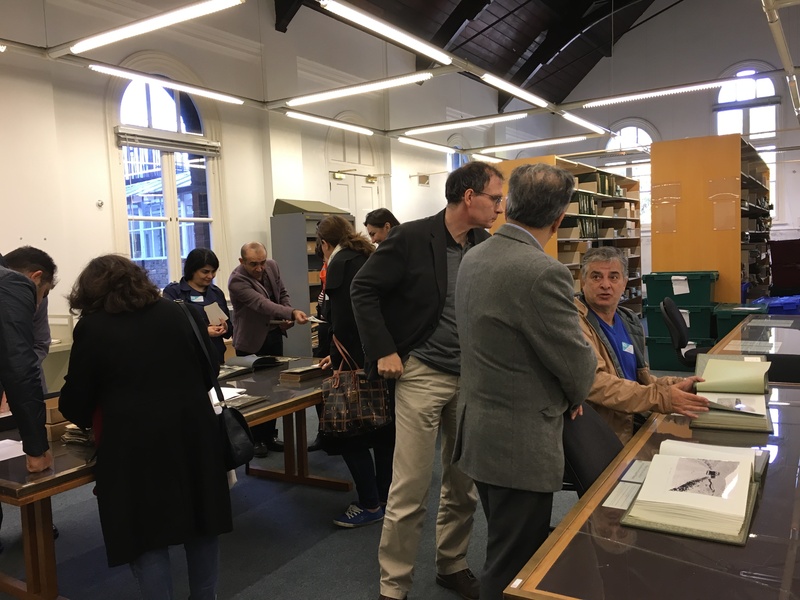 The visitors browsed through the photo collection provided by Mr Wakefield who patiently answered their queries; the collection included photos of barracks, British army officers, local people, cities, terrain and historic places in Persia. None of the participants had visited the IWM previously and most of them had not even been aware of its existence before receiving the Iranian Association’s advert about the museum visit. They said they would not ever have visited the IWM if they had not joined the group on 6th October. The IWM tour enabled the visitors to get an idea about the interconnection of the world events such as the links between the war on the Western Front and the military interventions in Iran during the First World War. They understood the importance of preserving historical collections and photos; some of the photos are probably not part of any other collections and are just preserved in the IWM. There were photos that were not labelled; therefore, the visitors tried to guess their locations by examining the terrain and buildings depicted in the photos. Mr Wakefield was always present to provide more insight into the real location of the photos. The visitors looked at the photos of the British Indian army and personnel located in the South, East and North East of Iran. A few participants were concerned about the fate of the photos that were not digitised and felt worried that they could be damaged or lost. Due to their nature, the black and white photos had captured effectively the gloomy war time years in Iran; they also somehow depicted how Persia, a neutral and helpless country caught in the middle of the FWW, suffered from the war. 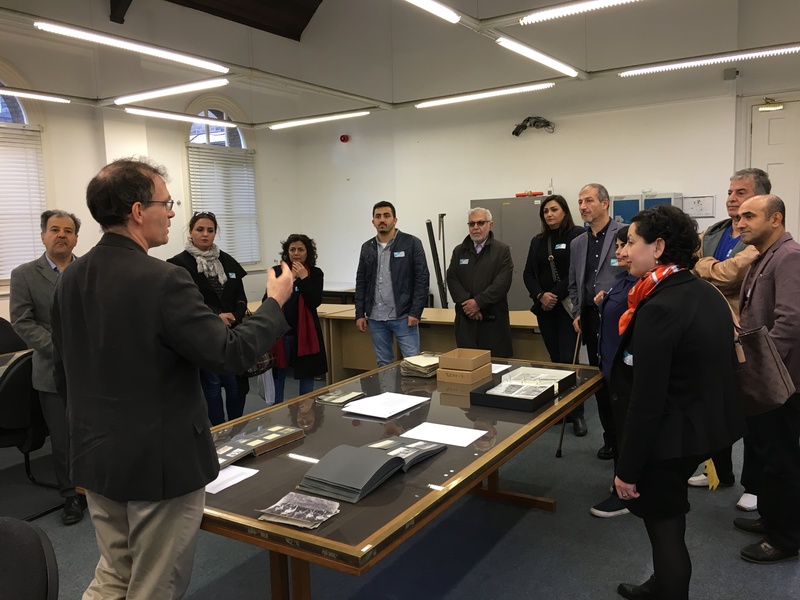 Having explored the photos, the volunteers/members of the Iranian Association were guided by Mr Wakefield to the main building of the Imperial War Museum where they visited an interesting exhibition telling the story of the FWW from different perspectives as well as depicting the human condition during the First World War. All the participants enjoyed the museum visit and felt that they had increased their knowledge of the First World War. The IWM tour helped the group members visualise the events of the war and put what they had read in context. The Iranian project kicked off with a planning meeting at the Iranian Association offices in Hammersmith, London. 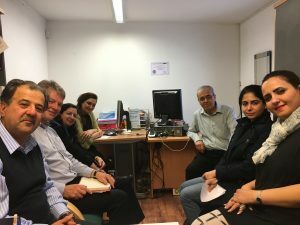 A small group of Iranian-born volunteers discussed the project, offering suggestions on the Iranian perspective, based on their own knowledge and experience. They identified areas for further research, using resources such as the British Library and National Archives. Attending the meeting were (left to right): Kaveh Kalantari, Director, Iranian Association; Robin Clutterbuck, ‘Away from the Western Front’; Ms Sadieh Mashaie (originally from Tehran); Ms Leila Fatehi, (originally from Hamedan); Mr Reza Khiaban (originally from Tabriz, East Azerbaijan Province); Ms Azadeh Tavoosi (originally from Tehran) and Ms Yasi Dehghani (originally from northern Iran, close to the Caspian Sea). Lyn Edmonds of ‘Away from the Western Front’ took the photo.